Download eAudiobooks, eBooks, and eVideos 24/7 to your PC, eBook Reader or other device from anywhere in the world. What are eBooks, Audiobooks, and Streaming Videos? Downloadable eBook: an eBook that can be copied to your personal computer and then transferred to a portable device, such as an eReader. Streaming Video: a video that you download and watch on your PC or, in some cases, a compatible portable device. Need more information about our eBooks or troubleshooting your device, look in the sections below. Another great source for more information to help you understand and use e-books and e-readers is the "E-books for Texans" website. This site was put together by the staffs of nine libraries in the Houston area, including the Hughes Public Library, with the assistance of consultant, Christine Peterson. We think it's a wonderful resource since it serves as a one-stop shop for how-to and troubleshooting information. You can check it out by clicking the picture below. The Library provides electronic content from several vendors including OverDrive via the Houston Area Digital Media Catalog, TumbleBooks Library and EbscoHOST. You can access this content from your home computer. If you wish, you can transfer downloadable eBooks to eReaders and eAudiobooks to MP3 players or iPods. Information on each of the services with links is provided below. 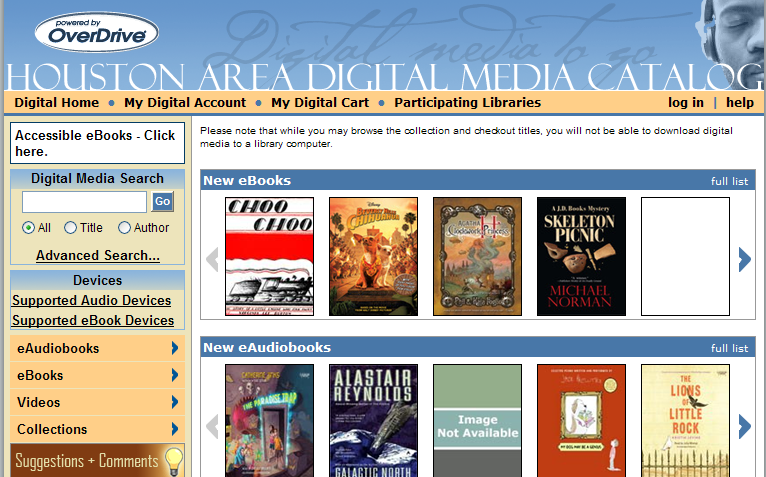 The downloadable collection can also be searched in the Hughes Public Library Catalog. To limit to eBook or eAudiobook, under "Material Type," click on the box next to Electronic audiobook or Electronic book, then click on the "include" button. TumbleBookLibrary is an online collection of TumbleBooks animated, talking picture books which teach kids the joy of reading in a format they'll love. TumbleBooks are created by adding animation, sound, music and narration to existing picture books in order to produce an electronic picture book which you can read, or have read to you. 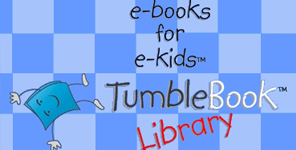 The TumbleBookLibrary is a collection of licensed titles from children's book publishers such as Simon & Schuster, Chronicle Books, Candlewick Press, Charlesbridge Press, Harcourt, Little Brown, Walker & Company, Lerner Books, and HarperCollins Publishers, amongst others. Bestselling audiobooks from a variety of publishers. Adult and juvenile downloadable video offerings. A selection of popular e-books for all ages. Check-out Periods: ebooks and audiobooks (14 days), videos (7 days). 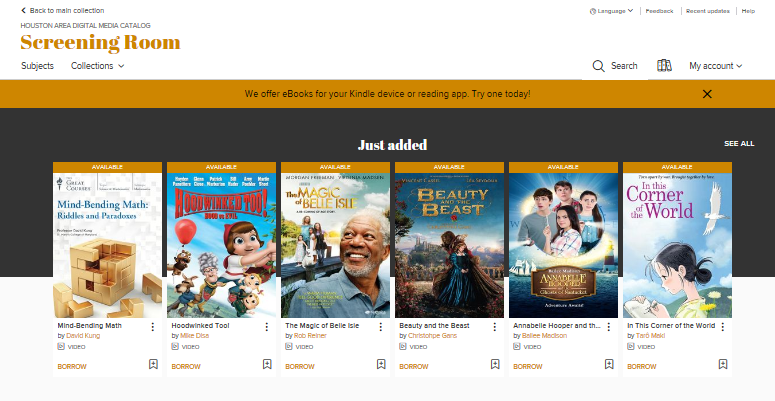 eBook devices currently supported by OverDrive can be found here. KINDLEs are now supported. For a quick how-to click here. Through OverDrive, the Houston Area Digital Media Catalog has purchased ebooks and eAudiobooks so all member libraries can access those titles. In addition to the titles bought by HADC, the Marion and Ed Hughes Public Library has purchased more titles for Nederland users through the OverDrive Advantage Program. To see the 'Advantage' titles that are available for you to check out or place on hold, you must log in to your account. For detailed instructions on how to check out or how to read eBooks at OverDrive check out the OverDrive's Getting Help with eBooks Page. Watch hundreds of movies and documentaries for free with your library card. Get started and watch them on your web browser through the Library's Overdrive Screening Room portal. For more information about the streaming video service check out OverDrive's Getting Started with Streaming Videos page. Access these sites that have free eBook and eAudiobook content. You will need to check to see if your device can read or play the particular format. To find more resources, just search on google.com for the terms "free ebooks" or "free audiobooks." Offers their own professionally-read literary classics. Play them here, or download them to your mp3 player. Use on your Nook, Nook software or Barnes & Noble eReader software or app. Says it's the Internet's #1 online source for free ebook downloads, ebook resources and ebook authors. While there is no way to restrict search results to downloadable books only, you can limit your results to books that are fully viewable by using the Advanced Search feature of Google Books. Just select the "Full view only" option, enter your search terms and click "Google Search." manybooks.net strives to provide eBooks in as many formats as possible. "The Online Books Page is a website that facilitates access to books that are freely readable over the Internet. It also aims to encourage the development of such online books, for the benefit and edification of all." Open Library is a project of the non-profit Internet Archive. The goal is one web page for every book ever published. Not every book listed has a free eBook version, but there are many available through Open Library and you can limit your search to eBooks. One of the most comprehensive collections of electronic texts on the Internet. Many books can be downloaded for iPad, Kindle, Nook, Android, iPhone, iPod Touch, Sony Reader. Smashwords is an ebook publishing and distribution platform for ebook authors, publishers and readers. We offer multi-format, DRM-free ebooks, ready for immediate sampling and purchase, and readable on any e-reading device. NOTE: Sometimes only a portion of a book is free.